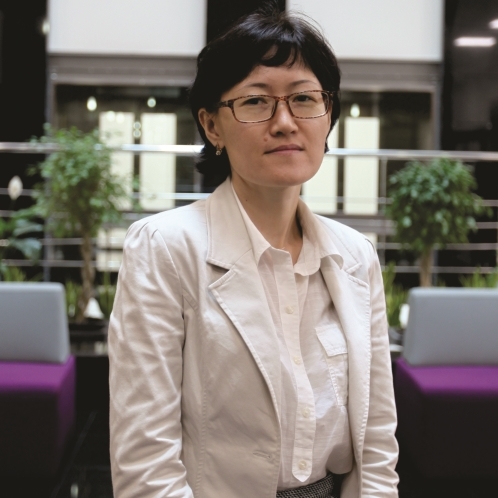 After graduating from the International Kazakh-Turkish University in Turkestan, Kazakhstan, with Medical Doctor degree, Dr. Raushan Alibekova in 2002 was enrolled in 2-years masters’ program at the Kazakhstan School of Public Health (KSPH) in Almaty city, Kazakhstan. Her interests were shifted to the area of public health and preventive medicine. She has been teaching at the Department of Health Promotion and Social Sciences of the KSPH. By recommendation of the KSPH she has got a grant from Soros Foundation-Kazakhstan to study a 1 year International Master of Public Health program at Braun School of Public Health and Community Medicine at Hebrew University-Hadassah in Jerusalem, Israel. After returning from studies, she continued teaching as a senior lecturer at the KSPH. She delivered lectures in Public Health, Health Promotion and Diseases Prevention, Mental Health, Epidemiology, Bioethics for health care managers and master students. During that period she was involved in conducting research, educational projects and conferences in the field of public health. During 2010-2013 she studied at PhD program in Public Health at Taipei Medical University (TMU) in Taiwan (TMU Scholarship: International Student Assistantship). Her dissertation topic was “Examination of the effects of maternal reproductive and mental health problems on adverse birth outcomes and infant health”. Preterm delivery and low birth weight are significant public health concerns and represent the leading causes of infant morbidity and mortality. In an attempt to examine adverse pregnancy outcomes the research objective was to explore risk factors associated with women’s mental and reproductive health. The first part of the study aimed to investigate the association of infertility with adverse pregnancy outcomes and to explore the effects of various measures of prenatal care on this association. This study was based on the analysis of the secondary data from National Health Insurance Research Database of Taiwan. The aim of second part of the study was to examine the association of longitudinal trajectories of maternal mental disorders and birth outcomes, and it was based on the ongoing research project: “Effects of maternal depressive symptomatology on pregnancy outcomes and newborn development – how is paternal psychopathology involved?” which is supported by the National Research Council of Taiwan (NSC99-2628-B-038-015-MY3). This is a prospective cohort study of pregnant women and their husbands, with multiple assessments of self-reported depressive and anxiety symptoms throughout the pregnancy and postnatal period, and estimation of their effects on birth outcomes. After returning back to home country Dr. Alibekova started working as an Instructor at the Department of Biomedical Sciences of Nazarbayev University School of Medicine in 2014.